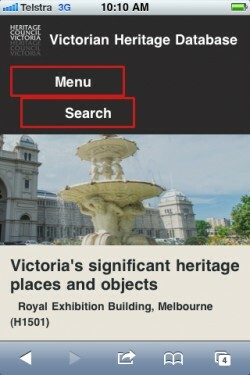 A trove of information about Victoria’s history is now available to smartphones, tablets and computers, highlighting the significance of almost 80,000 historic assets . The Victorian Heritage Database (VHD) has been overhauled. More information than ever is now available via a mobile- friendly site which works across smartphones and computers. The database is a research tool covering the state’s official list of significant places and objects. Having an easy-access database means people can read about local landmarks on the spot, from state-significant buildings such as regional courthouses and stately post offices to hidden treasures such as stained glass windows and shipwrecks. The Minister for Planning, Richard Wynne, said the new Victorian Heritage Database was now live and easy to use. “It is fascinating to learn the history of significant buildings we often walk past every day. We are also offering tourists a more informed, richer experience.” he said. The VHD includes a ‘search near me’ feature, capacity to build customised heritage tours and save searches. As well as heritage assets, the databases include all known historic archaeological sites in Victoria plus the heritage records of 24 local councils, the National Trust of Australia’s Victorian listings and the Victorian Veterans Affairs’ Victorian War Heritage Inventory. Mr Wynne said the database would prove useful for property buyers researching neighbourhoods, students and heritage practitioners. Mr Wynne encouraged Victorians to delve into the database starting with a search of their suburb to reveal more about the historical treasures in their area, and keep it in mind when travelling around the state.